It’s the day you’ve always dreamed of but let’s face it -you may not have your dream budget. No worries! Here are some helpful tips that will keep you right on track creating the wedding of your dreams on any budget. 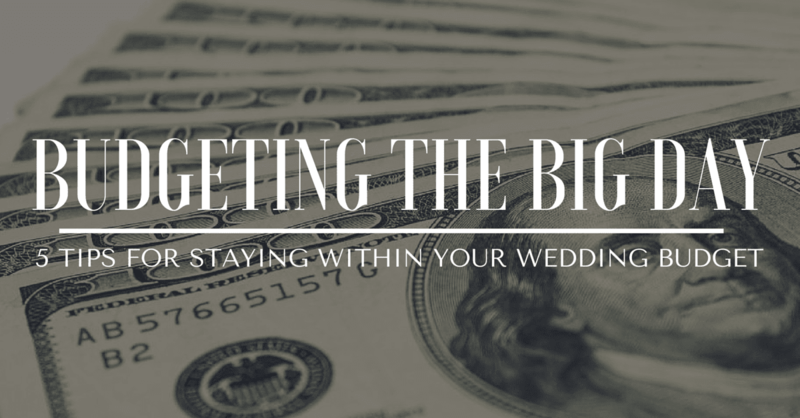 Discussing money can be uncomfortable, but it’s the only way to make sure bride, groom, and both families are on the same page. Make a wedding budget game plan for staying within your budget and discuss how costs will be split. Taking the initiative to have this discussion from the start will save you a lot of unwanted stress and confusion in the future. You have Pinterest board after Pinterest board of wedding ideas, but it’s time to prioritize. What do you absolutely want for your wedding and what can you do without? This will help you decide what you want to splurge on and what you can cut down on or cut out altogether. If catering and music for your reception are top priorities, get creative with your decor to see what you can make yourself! Trading and bartering is becoming a popular tactic of brides on a budget. Assess what skills you have that someone else might find valuable. Have mad photography skills? Offer to give your makeup artist or hairdresser a salon photoshoot in exchange for hair and makeup on the big day! This method doesn’t work for everyone, but can be a great way to save some money. Hold your own with vendors. Vendors will always try to make as much money off of you that they can -it’s their job. It can be easy to let vendors talk you into going outside of your budget. Don’t let this happen! Politely lead with what your budget is and ask them how they can help you get as much out of your budget as possible. The most important thing you can do to stay within your budget is to stay focused. Remember the real reason for the day -you’re getting married! When it comes down to it, the wedding day is about you and your future spouse and the love you share, not how much you spent.